About 2 million doses of platelets are given in the United States every year. 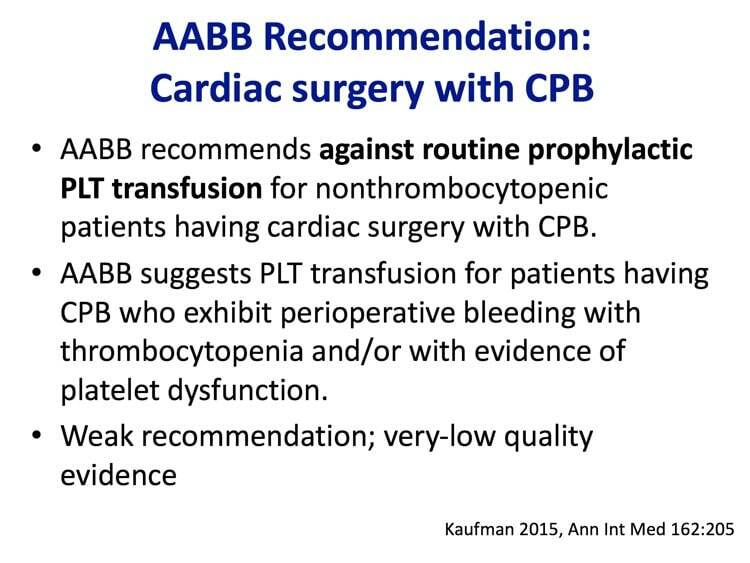 You might be surprised to know, though, that most are given “just in case.” Dr. Rick Kaufman returns to the podcast to discuss the 2015 AABB Platelet Clinical Practice Guideline. Platelets are tiny little nucleus-free cells that seem to cause more than their fair share of discussions and problems! Most blood bankers believe that we have made less progress in improving platelet transfusion practices than we have made with red blood cell transfusions. 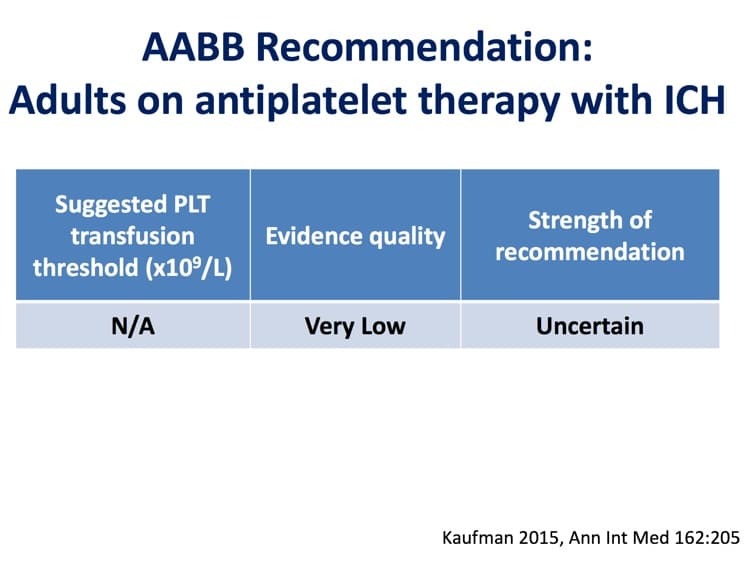 To that end, the AABB released a “Clinical Practice Guideline” in 2015 summarizing the evidence surrounding platelet transfusions to date. Today’s guest, Dr. Rick Kaufman, was lead author on that paper. 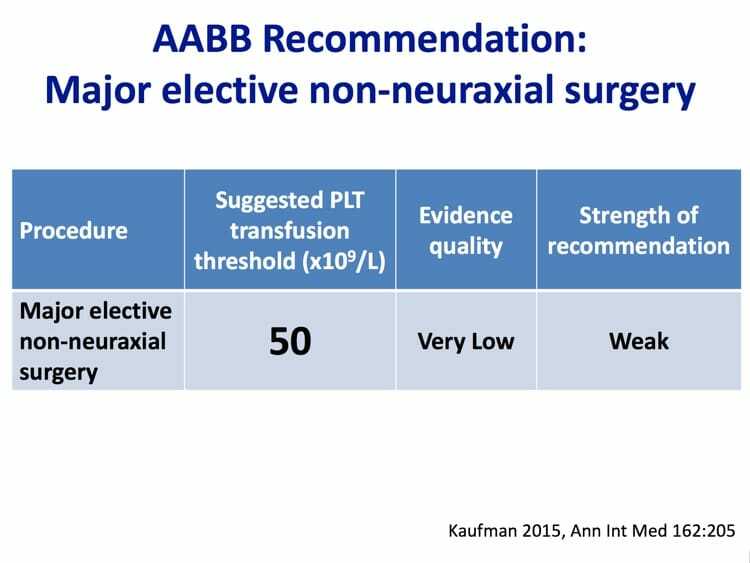 Dr. Kaufman takes us on a tour of the evidence (such as it is) regarding prophylactic (“just in case”) platelet transfusions, platelet transfusions before minor procedures like central venous catheter insertion and lumbar puncture, major non-neurologic surgery, cardiac surgery with cardiopulmonary bypass, and intracranial hemorrhage in those on anti-platelet medications. What Rick and the other authors found may surprise you! 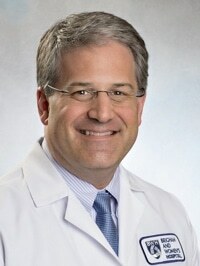 Dr. Rick Kaufman trained in Clinical Pathology and completed a Transfusion Medicine fellowship at Washington University in St. Louis before relocating to Boston. Rick is currently medical director of the Brigham and Women’s Hospital Adult Transfusion Service, and an Associate Professor of Pathology at Harvard. After this interview was published (and not because this interview was published! ), Rick was named editor-in-chief of the preeminent journal in Blood Banking and Transfusion Medicine: Transfusion. 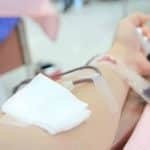 He is a previous guest on this podcast, outlining the potential impact of the drug daratumumab (“DARA”) on blood bank testing in episode 010. DISCLAIMER: The opinions expressed on this episode are those of my guest and I alone, and do not reflect those of the organizations with which either of us is affiliated. Neither Dr. Kaufman nor I have any relevant financial disclosures. The images below are generously provided by Dr. Kaufman. 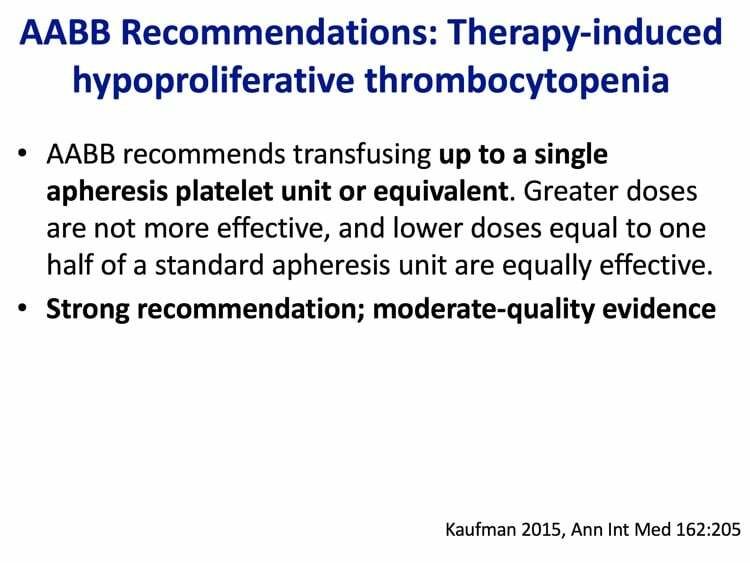 2015 AABB Platelet Clinical Practice Guideline: Kaufman RM et al. 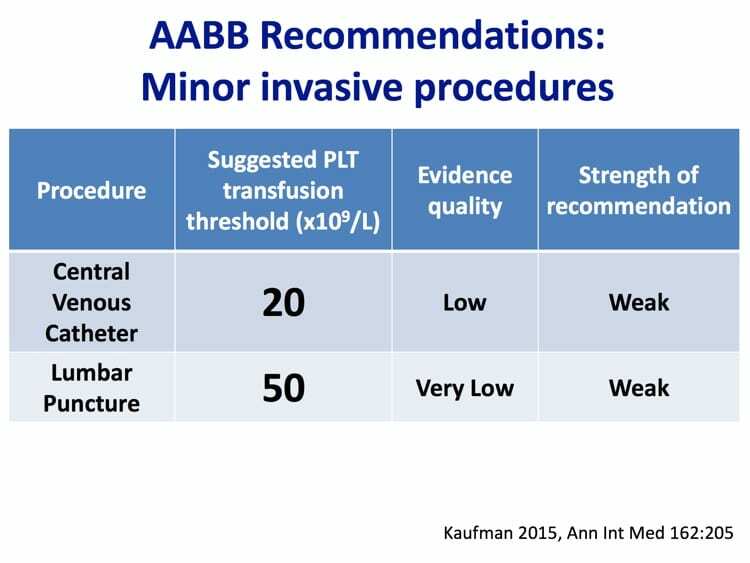 Platelet Transfusion: A Clinical Practice Guideline from the AABB. Ann Intern Med. 2015 Feb 03; 162(3):205-13. 1962 NEJM article on platelet count and bleeding: Gaydos LA et al. The Quantitative Relation between Platelet Count and Hemorrhage in Patients with Acute Leukemia. N Engl J Med. 1962; 266:905-909. “Wandt study” showing greater bleeding in those without prophylaxis: Wandt H et al. Study Alliance Leukemia. Therapeutic platelet transfusion versus routine prophylactic transfusion in patients with haematological malignancies: an open-label, multicentre, randomised study. Lancet. 2012;380:1309-16. Trial of Prophylactic Platelets Study (TOPPS): Stanworth SJ et al (TOPPS Investigators). A no-prophylaxis platelet-transfusion strategy for hematologic cancers. N Engl J Med. 2013;368:1771-80. “Rebulla study” showing similar risk for threshold 10K or 20K: Rebulla P et al. The threshold for prophylactic platelet transfusions in adults with acute myeloid leukemia. Gruppo Italiano Malattie Ematologiche Maligne dell’Adulto. N Engl J Med. 1997;337:1870-5. PLADO study showing low-dose and standard dose platelets equally effective: Slichter SJ et al. 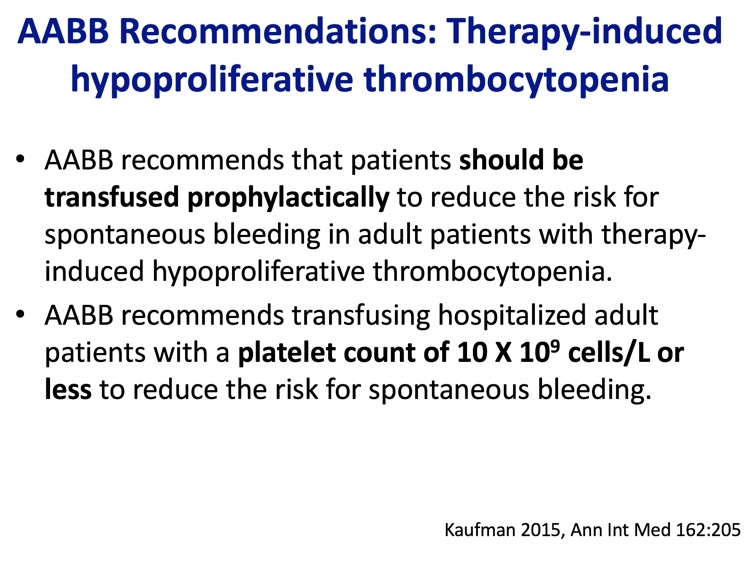 Dose of prophylactic platelet transfusions and prevention of hemorrhage. N Engl J Med. 2010;362:600-13. Follow-up to PLADO showing alloimmunization in the trial: Hess JR et al. Clinical and laboratory correlates of platelet alloimmunization and refractoriness in the PLADO trial. Vox Sang. 2016 Oct;111(3):281-291. Single center study of pediatric lumbar puncture in thrombocytopenia: Howard SC et al. Safety of lumbar puncture for children with acute lymphoblastic leukemia and thrombocytopenia. JAMA. 2000;284:2222-4. 2009 Interventional Radiology guidelines mentioned by Dr. Kaufman (differ from AABB recommendations): Malloy PC et al (Standards of Practice Committee with Cardiovascular and Interventional Radiological Society of Europe (CIRSE) Endorsement). Consensus guidelines for periprocedural management of coagulation status and hemostasis risk in percutaneous image-guided interventions. J Vasc Interv Radiol. 2009;20:S240-9. PATCH study showing possible worse outcome with platelet transfusion in patients with intracranial hemorrhage on antiplatelet therapy: Baharoglu MI et al. Platelet transfusion versus standard care after acute stroke due to spontaneous cerebral haemorrhage associated with antiplatelet therapy (PATCH): A randomised, open-label, phase 3 trial. Lancet. 2016 Jun 25;387(10038):2605-13. Mary, here’s the problem: While FDA has said that platelets stored at 1-6 C is an option (see 21 CFR 610.53(c) and an exception at this FDA page), you really can’t switch back and forth between 20-24 C storage and 1-6 C storage. If you are doing 20-24, which pretty much everyone is, you can’t just say, “Oh, we are ok with this product because 1-6 is ok, too.” To my knowledge, most people doing cold-stored platelets in the US are doing it as part of a study protocol (though I’m sure that’s not everyone), and I think you pretty much have to be doing that type of storage routinely before you could keep a unit that you know has been stored in a way not consistent with how you are routinely storing platelets. Are platelets after exposure to cold temperatures not useless? The would be altivated and they already released the Content of their granula. So now, all substances sequestred in the Granula, are free in the solution and the platelets are empty. Could it be dengerous for the Patient? Dangerous? Not really. We’ve known about storing platelets in cold temperatures for a long time, and they don’t harm people, as far as I can tell. It IS true, though, that they do not circulate nearly as long as room temperature-stored platelets, and that they are activated at transfusion. That may not be a bad thing in a trauma or other urgent situation, but it wouldn’t be good for a patient with therapy-induced thrombocytopenia where you are looking to keep the count up for longer.